Since graduating Andrea has worked primarily in orthopaedics with a focus on sport injuries. Being from Fernie BC, she has worked significantly with ski/snowboard injuries and mountain bike injuries. She is also passionate about pediatrics and loves working with children and encouraging them to live an active lifestyle. Andrea has taken post graduate courses including Mulligan’s Mobilization with Movement, k-taping, and has her certification in Anatomical Acupuncture through the Acupuncture Foundation of Canada (AFCI). 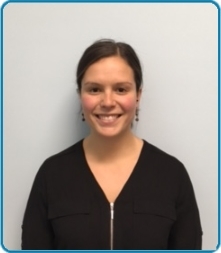 She is very keen to continue with post-graduate training in dry needling and plans to pursue her Diploma of Advanced Orthopaedic Manual and Manipulative Therapy. Andrea recently moved to Kamloops in 2017 with her husband and two dogs. Outside of the clinic you can find Andrea attending CrossFit, playing/coaching basketball, and exploring the outdoors by hiking the trails with her two dogs, camping, fishing, and horseback riding.